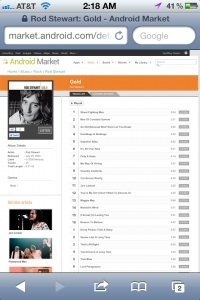 "Once the Google Music store in the Android Market went live, I made my first Android Market music purchase." So how did it work out? Once you read the review you will see that it wasn't all peaches and cream for him as sticking with the Apple ecosystem means all products work and you get the full use of capability. Not so much when you start mixing in products from other companies meant to replace a current Apple product. Although he does say its getting closer to being a similar experience, but it still isn't all there. Which is to be expected to a certain degree I think. I run a mix of sources for my music purchases, such as using Amazon.com for some deals, but I always put the stuff back into iTunes so it all works seamlessly with my devices. What are your experiences? Thoughts?